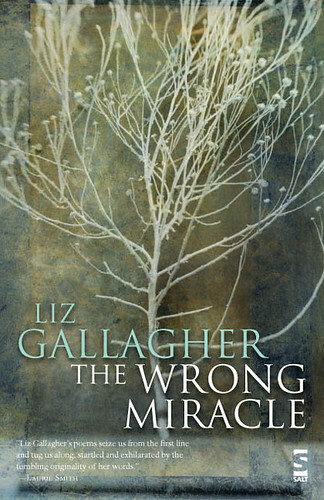 The Wrong Miracle by Liz Gallagher uses tongue twisting phrases and juxtaposition to shed light on and deal with the expectations of family and society. Wrong miracles occur everyday in Gallagher’s world from the cat that drags in a poem it found to a breeze that cracks the narrator open. Gallagher’s playful phrases will have readers smiling in amusement, and she enjoys turning cliches upside down. In many cases, Gallagher is whimsical with her imagery even when her poems deal with serious events, such as paying for the best and getting something unexpected and disappointing. In “Woman in a Redhead,” she seeks a new look, cappuccino hair that ends up being red and having to deal with the result. But beneath the whimsy of her verse lies a dark anger and disappointment that simmers and bursts forth. Can you talk yourself into doing anything? Can you justify waterboarding like you can justify jumping out of an airplane with a parachute as a hobby? Is the unthinkable a norm that we haven’t gotten used to yet? Gallagher asks these questions and more, but she also examines fatherly love and forgiveness. A handkerchief is not an emotional holdall. A cup of tea does not eradicate all-smothering sensations. willing a chin to lift and an upper lip to stiffen. of sand in an hourglass have filtered through. came crashing down in the middle of the night. to come out tinkling ivories with every gasp. and walking a tightrope with arms pressed tightly by its sides. Readers just starting out with poetry will find this collection needs to be read aloud and more than once because some of the lines are dense with imagery, double-speak, and juxtapositions. However, the poems do exude a song-like quality as tongue-twisters roll off the tongue, which will have readers repeating Gallagher’s lines over and over again. The Wrong Miracle by Liz Gallagher is a buzz worthy collection. Thanks to Liz for sending me a copy of her book for review. Liz Gallagher was born and brought up in Donegal, Ireland. She has been living in Gran Canary Island for the past 14 years. She has an Education degree where she specialised in Irish language. She also has a Computer Science degree. She is at present doing research into online debating for her PhD. 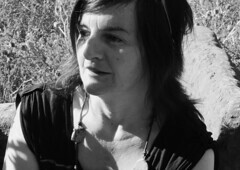 She began writing about 5 years ago and has won a variety of awards in both Ireland and the US: Best New Poet 2007 (Meridian Press, Virginia University) First Prize in The Listowel Writers’ Single Poem Competition 2009 and she was selected by Poetry Ireland for their 2009 Introductions Series in recognition of her status as an emerging poet. 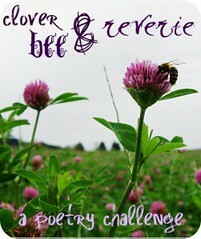 This is my 6th book for the Clover Bee & Reverie Poetry Challenge. 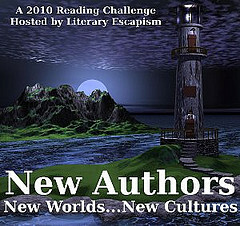 This is my 35th book for the 2010 New Authors Reading Challenge. Taanks, Serena! I’m going to order it right now. I usually don’t read poetry, but the pieces you’ve included in this review read well. Thanks for the suggestion. I’m glad you enjoyed the excerpts. Oh, Serena, I loved your review of this collection of poems. I’m hooked. I’d sooooo love to buy this book, but thus far I can’t find it anywhere here in the States. Beth, you have to buy it through the link I provided to the title, which translates to about $14 in US dollars after the conversion. It wasn’t too bad. I hope you do purchase the collection. It’s a good cause and an excellent collection. Glad to be of help. I hope you enjoy it. Maybe this collection is not for you, but there may be one out there! Lovely review, Serena! You’re going to have me reading poetry before it’s all over with. How did you ever deduce my plot! 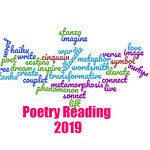 I’m hoping to make you all occasional poetry readers! This is one collection that I’ll definitely have to borrow from you! Whenever you are interested in reading it, just let me know! I like the excerpts you included! I’m glad that you enjoyed them. This is a powerful collection.